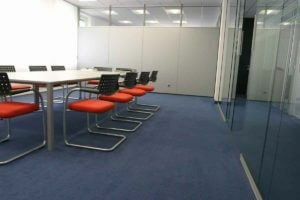 Have the carpets in your office or business cleaned with Delta Chem-Dry. Facilities spend millions of dollars on carpeting, furniture and oriental and area rugs as part of their overall image. They know that poor maintenance can negatively affect their professional image. So to combat it, they often waste thousands of dollars in worthless cleaning costs that don’t leave lasting effects. Our commercial carpet cleaning service is different. We ensure that your investment is properly cleaned and protected. We understand the need to not only maintain a healthy indoor environment but also to extend the life of your expensive carpet, rug, and furniture investments. We take pride in our ability to work with most budgets, and we’re confident that we can come up with a cleaning plan and routine that will work for any work environment! We also know that cleaning these fabrics requires state-of-the-art equipment designed to use the lowest possible amount of moisture. With dry times of one to two hours, your business can continue running with little or no disruption. Our highly trained professional technicians are more than capable. We provide the cleanest clean, the driest dry and the healthiest process with the most advanced carpet and upholstery cleaning methods available for your commercial carpets, rugs, fabrics and leather.